The compact Hero Session makes it possible to capture the action like never before. HERO Session packs the power of GoPro into a convenient, grab-and-go, everyday camera. Perfect for the first–time GoPro user, or as a second camera, HERO Session is the simplest GoPro camera to date. Its single button control, stunning 1080p60 video, 8MP photos and rugged, waterproof design make HERO Session the perfect small, simple camera to take on any adventure. When it comes to adventure you want a camera that's ready to grab-and-go. From capturing spectacular footage; such as base jumping off Angel Falls to simply recording the memories of a fantastic family day out. The compact GoPro Hero Session has now arrived at Currys, pop along to the site to check out and order yours now. The GoPro Hero Session is built ready for action with a sleek compact waterproof design that weighs in at just 2.6oz (74g), the simple one button operation makes it an ideal first-time action camera, as well as being an ideal option for existing GoPro users simply wanting another camera to capture the action in spectacular quality. The camera's cubed design is contained within the ingenious skeleton frame, this means that it's easier than ever to attach this GoPro and adjusted it to the correct orientation. Auto orientation correction within the camera means that it doesn't matter which way up it's mounted, when the footage is played back it will always be the right way up. Not only does this make it easier to view back on your mobile device but this feature will also save you time when it comes to editing. The key to capturing stunning footage with your GoPro is how and where you mount the camera. There's a huge selection of accessories and mounts to choose from, for a full selection pop over to Currys. Designed so that you don't miss the action the GoPro Hero Session features ultra simple operation. One touch of the shutter button is all that's needed to power the camera on and start recording. Other modes can activated directly through the shutter button, with time-lapse sequences being captured by a quick press and hold of the button for three seconds. As well as stunning video the GoPro Hero Session will also capture still images, simply download the GoPro app to your mobile device (Available for both iOS and Android) and additional modes and settings can quickly be accessed. If you own a Apple Watch then an ultra convenient app can be used to control the Session directly from your wrist. 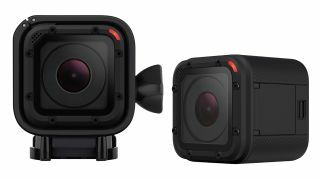 GoPro have built their brand around the robust go anywhere design and the HERO Session is no exception. Designed to withstand extreme environments the Session can be taken anywhere, and is the first GoPro that is waterproof to 33' (10m) without the need for an external housing. The sealed design not only enables you to take the camera anywhere but the use of tough quality materials for its construction ensures that it's durable enough to withstand a knock or two, or a day's adventure with all members of the family. Capturing the action in stunning quality is at the heart of all GoPro cameras. One touch operation enables you to capture the action without fuss, but if you do want a few more options then connecting to the mobile app will enable resolutions and frame rates including 1440p at 30 frames per second (fps), 1080p at 60fps and 720p at 100fps. Although the Session doesn't feature a built in live view screen, the easy to use app enables a fast direct live view once connected, as well as the ability to operate the camera remotely. Keeping things simple is key to the Session so as well as shooting stunning video the camera is also designed to capture equally impressive stills. Connecting to the app enables you to quickly activate the 8mp stills capture, once this mode has been selected a quick push of the shutter button is all that's needed to take a picture. As with the video mode the live view stream enables you can see the exact composition. Stills are just the start of the camera's imaging ability and if want to get creative with your photography then there are some impressive additional features that can be selected from within the app. These enable you to stop and capture fast past action with the 10fps burst photo or if you want to capture the passing of time the time-lapse photo mode with options between 0.5 to 60 seconds is the perfect solution. Auto power on and record is a handy feature when you just want to get out and record the action, but as with all action cameras power is limited. To help preserve power the GoPro Hero Session automatically powers down when not recording to avoid the battery from draining. The battery is sealed within the Session helping to protect it in all environments, yet despite the high level of protection the camera can be easily charged through a standard Micro USB.